Uglyworld #932 - January Sales (Project BIG - 15-365), originally uploaded by www.bazpics.com. Todays Ice-Bat tells me that he hears that there is still some Januaries sales goings on and thats some of the bestest deals is still to be hads. If you isn't sures what I is talkings about then Januaries sales is when the shop peoples has lots of goodies lefts over from their stocks befores christmas and then as they needs to makes rooms for new stuffers they sells off the older stuffers cheapers. 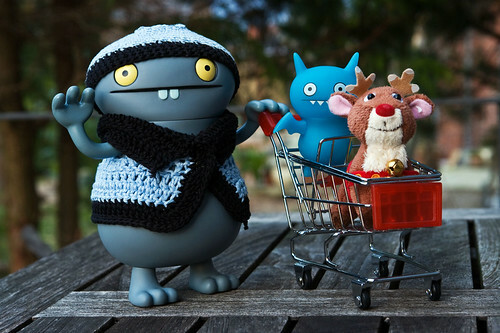 As you can imagines Ice-Bat was as highs as a kite when we were walkings around lookings at all the amazing deals, but we both couldn't believes our eyes when we finded a reindeer on sales. He telled us both that his name wass Rudolfs and that he is very well house trainered, and that he wanted to finds a nice family to lives with until he is neededs for his winters job at the ends of the year. How coulds we pass ups the chance to has a reindeer living with us, I just hopes that Baz and Mireille approves when they gets home!